THIS IS YOUR LUNA, AND YOUR SEASON! As I shuffled, I was stunned and filled with joy by each card that came out for you. MAJOR blessings and abundance are heading straight down your alley. Not only did you get The Star and The Magician in your reading, but you also got two Aces, and The World card as your energy. You truly deserve everything that is coming to you. Get READY. Times have been hard lately, haven’t they? The 5 of Pentacles coming out first is a strong signal that you Gemini, have really been going through it. You may have recently felt like life just hasn’t been treating you fairly, like you have been out in the cold, in a distant place where nobody really understands or appreciates you. Lighten your load, Gemini. You need to make space for all of the blessings coming to you now, to remove that cold and dark feeling you’ve been experiencing. Your season is arriving right on time, and this new moon calls an end to all the suffering you have experienced within the last lunar cycle. In the collective new moon reading, it was apparent that a karmic audit is being done on all twelve zodiac signs. But you my dear, are in the clear. Gemini, not only are you going to completely involve into a new version of yourself, and be filled with inspiration and a new found confidence, The Star and Ace of Cups says that you are going to experience a brand new love. Be prepared. This may actually last a lifetime. A new found way of loving is now entering your heart and head space. A new, and happier you, is now emerging. The Magician came through towards the end of your reading, ensuring that all of the blessings that come to you on this new moon, and by the end of your season, are real. And you beloved, are going to master being completely open enough to receive them. This is the moment you have been waiting for, beloved. This shiny Ace of Pentacles is falling right into your lap. Nobody deserves it more. Please Gemini, make a wish! Any wish your heart desires. The cosmos are compelled to serve in your favor on this new moon. Whatever you have truly been wishing for, is now navigating directly to your doorstep. Open up with arms wide open. The World as your energy card is declaring that this season is going to come full circle for you. This new moon is going to change your life, and you are going to find real, true happiness. It begins now. Right now, Gemini. Don’t let this moment slip away from you by holding on to any self limiting beliefs or fears involving your value. You beloved, are so worth it. You are so brilliant. You deserve love and success just like anyone else. I would say “may the cosmos be in your favor,” but it’s already been confirmed that they are. Don’t let this comic power go to waste. Follow your heart this time, and make one more wish. Everything you wish for, is finally coming true. Let your freak flag fly, and wish for something bizarre! Your options are limitless. On this new moon, set intentions to manifest, and affirm into the universe that you are open and grateful for every blessing coming your way. You can clap now, beloved, you’re getting exactly what you want. The blessings are here. Enjoy your luna. We all only get one new moon a year. Tonight, she shines just for you. 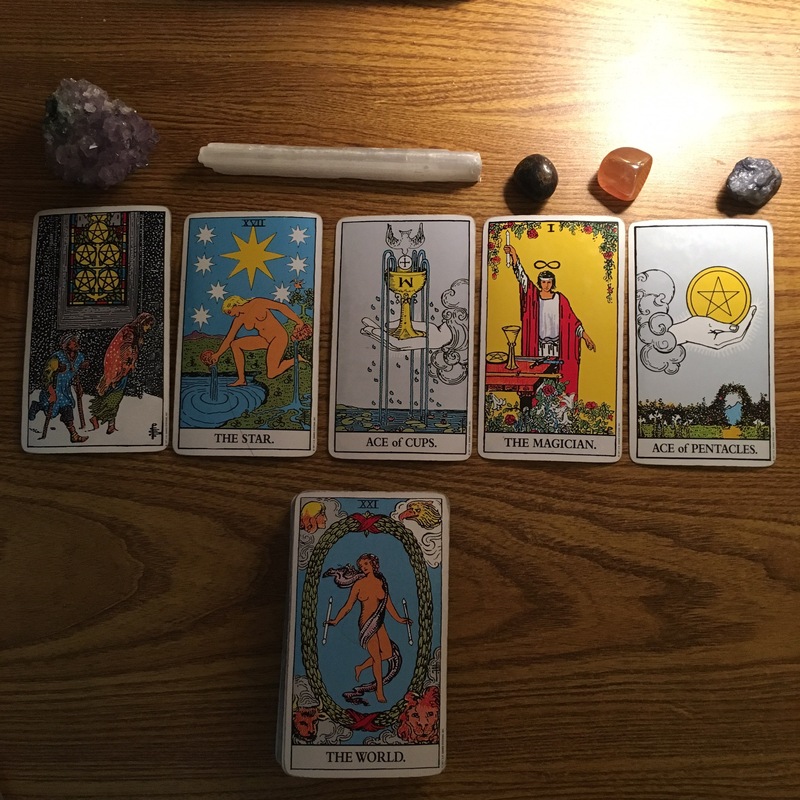 Previous Taurus: New Moon in Gemini Tarot reading, 2017. Love is still the answer. Expect miracles and new beginnings! Next Cancer: New Moon in Gemini Tarot reading, 2017. Hold on to your power and happiness. You can put out ANY fire.